Letzte Änderung am Mittwoch, 13. März 2019 um 22:23:08 Uhr. 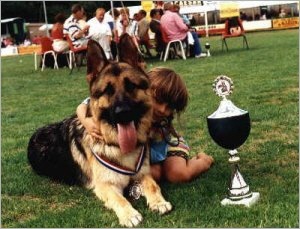 Especially in the southern European countries the sable shepherd is not particularly popular, especially among breeders of the so called Show Lines. I cannot tell you why this is so. Still, I would like to try to get rid of some of the prejudices. My aim is not to turn every reader of these lines into a passionate fan of sable dogs in half an hour. 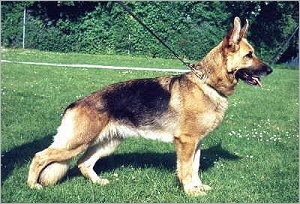 I want to try to explain, in an understandable way, why and how to use the hereditary qualities of the sable dog in your breeding program in a sensible and clever way. Before getting to the actual point, here is a little theory first. Black with red-brown, brown, yellow to bright gray marks. Black uni-color, gray, darkly clouded over, black saddle and mask. Inconspicuous, small, white chest marks, as well as bright colored insides are allowed but not desired. 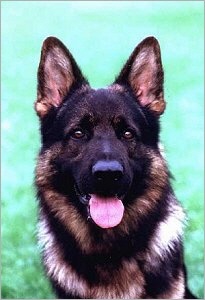 The nose has to be black for dogs of all color variations. Missing mask, bright or even piercing color of the eyes as well as light or whitish marks on the inner sides, bright claws and a red tip of the tail are to be assessed as pigmentation weakness. The under-wool shows a light gray color. The color white is not permitted. I don’t want to get deeper into the genetic basics of these colors. This can be studied in publications like for example "Schleger". In this article I will refer to the black and yellows, black and reds or black and browns as black and brown to keep things simple. The sable color is described differently from different points of view. All of the following variations are to be considered as "sable", whereby more or less bright cheeks and bright inner marks all count to this "sable". Up to middle gray all variations are desirable and not to be penalized, except for bright cheeks and pronounced paleness on parts of the legs. Trying to diversify these color variations will probably lead to many different opinions-as far as the descriptions is concerned. 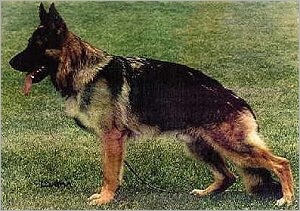 The official, listed variations of the sable color can be found on the German pedigree. The original color categorization made when the dog is tattooed often seems to be incorrect when you see this dog three years later. The gray-bright yellow dog with a dark line on the middle of the back has turned into a deep dark-gray-brown dog. And vice versa, the dark-gray-brown dog has turned into a gray-yellow dog. This development, which at first sight is not evident, (seems hard to believe) is not so rare after all. It is certain, that as a rule of thumb, a sable develops his final color up till the age of three. Based upon my experiences as a breeder, I believe that one can say that the extend to which the mask or the pigmentation of the outer ear is pronounced or not, can be indicative for the extend of pigmentation the sable dog will have as an adult. When is a dog sable? 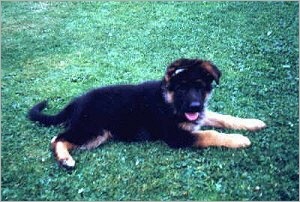 As a matter of principal, the sable color of a dog is determined directly after birth. At that very moment, it is defined if a dog is black, black & brown, or sable. This is what the pups will look like later. 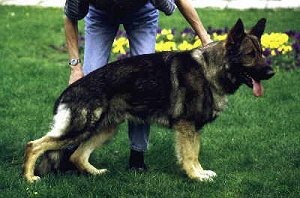 I am often asked where the sable color comes from on an adult black & yellow dog with no solid black saddle. This is not a sable dog, he just doesn’t have a solid black saddle. It is a fact however, a gray & yellow dog as a puppy is sometimes hard to distinguish from a black & yellow one that doesn’t have a solid, closed black saddle. In no way, can we now start correcting the original color of this dog on the pedigree and turn him into a sable dog because he will never be a sable. Therefore, he will not be able to improve pigmentation either. 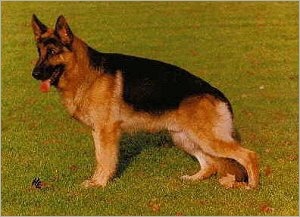 Does a sable dog really improve the pigmentation? One really should not believe that sable dogs can do miracles to the pigmentation, especially in a population where for decades, the black & brown to red or the bright yellow dog was preferred. This can not be done in one single step or only to a very limited extend. In certain cases some fast changes can be brought about by a sable dog. More about that later. When they are multiplied among each other without consideration or target, more or less pronounced color reductions will appear in both cases. The brightening will be more pronounced in the case when the natural effect of the Mendel Laws will make a heavily frequented dog appear as a brightener, although he doesn’t necessarily have to be a clear or bright colored dog himself. If after the 3rd or 4th generation of sole black & brown breeding, a sensible gray combination is made, or the other way around, if after several generations of purely sable cross-breedings a black & brown combination is made, no loss of pigmentation will occur. 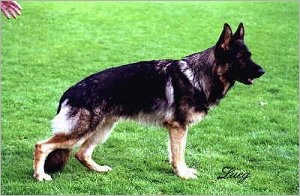 People often say that a well pigmented black & brown animal, who in his turn, has one sable parent, produces a better pigmentation for both the sable as well as for the black & brown offspring. Or that: sable combined with sable always gives a brighter, clearer sable. As far as my own personal experience goes, this is basically correct. But the line of succession, cannot be assessed in such a general, overall way. It is not true either that in a population, where 95% is black & yellow, the sable factor will become insignificant in the genetic material. The contrary is true. The sable gene cannot loose intensity or brighten in this case because it is not being challenged in these black & yellow combinations. Therefore the transmission of the pigmentation underlies certain rules, in a similar way as the transmission of long coat. If a homozygous partner in black & brown (if such a dog exists at all) is combined with a homozygous sable partner, the color of the offspring would be in-between the color of the parents. Theoretically, we would find pups with the following colors: Gray-brown, gray-black, gray-brown or gray-black clouded over. 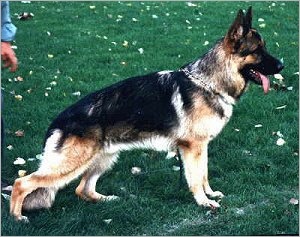 As I indicated before, I do not know of any dog that evidently has dominantly passed on his black & brown color to more than 100 of his offspring, of course in a combination with a sable partner. 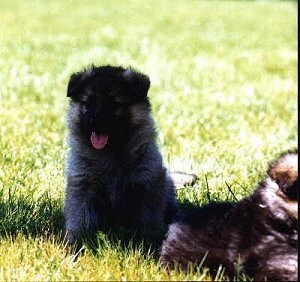 Also the dominantly producing sable dog (I personally don’t know any) would pass on his color or his color variation "sable" to all of his offspring, including the pups stemming from a black & brown – sable combination. this means, he does not produce long coats at all. If a dominantly producing sable dog would be known nowadays, he would certainly present a way to at least restrict the problem with long coats on a short term. Nobody has to fear now being restricted to the sable color for the rest of his life once he has used a sable animal. Only when at least one of the parents is sable itself, a sable pup can be born. Only black & brown pups can be born when both parents are black & brown: No matter how many of their ancestors were sable. If in a litter like this, a sable pup is born, we can be assured that a sable parent was directly involved. On the other hand, black & brown pups, or even black pups can be born in a sable – sable combination. This too, isn’t so rare at all because the black & brown color as well as the black color is recessive. 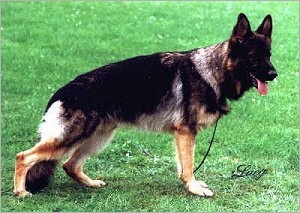 No one who is planning to use a sable male or female for breeding will be condemned to the sable color for the rest of his breeders life. I deliberately say this in such a provoking way, since very often this is the main argument against the use of sable dogs in breeding. 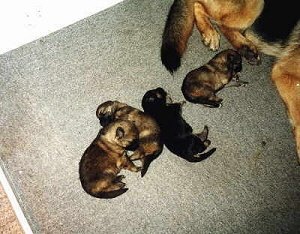 If a black & brown female is bred to a sable male or vice versa, the litter will statistically consist of an average 50 % of sable and 50 % of black & brown pups. 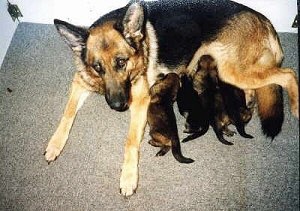 If this same breeder will continue to breed the black & brown dogs from this litter, -maybe because he simply doesn’t like the sable color- and combine them with other black & brown dogs, the offspring will never be sable again. 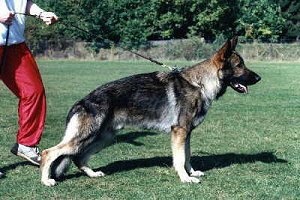 The advantage of the single use of a sable dog is the quick improvement of the pigmentation in comparison to the parental generation. Unfortunately, I have often observed people taking the wrong path. 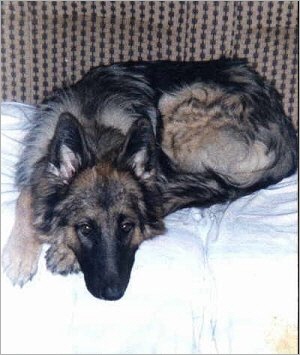 The breeder with an extremely bright colored female is thinking about his last chance, -maybe a sable dog can do the trick- and this sable dog is expected to cure all of the problems that this breeder has neglected for many, many preceding generations. and everything will be all right!! Sometimes it works, but only sometimes. Sable is supposed to improve pigmentation?? – Nonsense!! Nobody has ever been able to write the secret formula for good pigmentation. The sensible use of sable dogs certainly is a way. If we want to improve pigmentation we have to pay attention to the practical hereditary transmission which has to be defined. There are several different alternatives, if we have statistical record of how the animal involved produces. To improve or reinforce the pigmentation of a black & yellow dog we can follow two paths. 1. 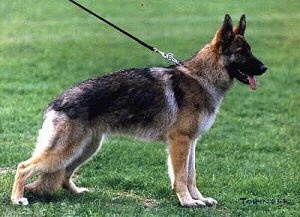 We breed this black & yellow female (with low pigmentation factor) with a sable dog or with a black & brown male with a strong pigmentation with ancestors that demonstrably stem from generations consisting of alternating sable and black & brown combinations. 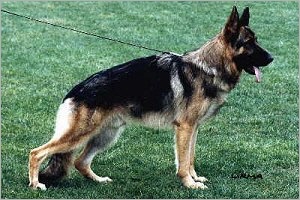 For the hereditary transmission, it is irrelevant whether it is the female or the male that has the sable or the black & brown color. 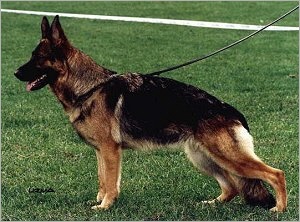 The litter with the sable sire, will presumably consist of sables and well-pigmented black & brown pups. 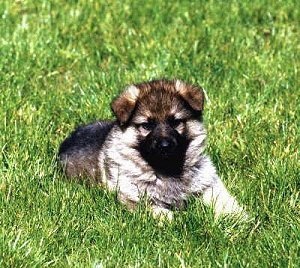 The litter with the black & brown sire will consist of black & brown pups only, of course. 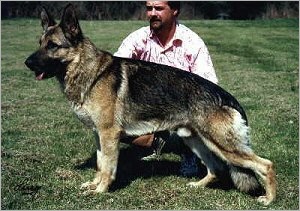 A sable partner, bred purely sable over several generations (either on the paternal side or on the maternal side) will produce a less pronounced pigmentation in his sable offspring as well as in his black & brown offspring. If we were to breed a black & yellow female (with low pigmentation) with a homozygous sable (AA), i.e. 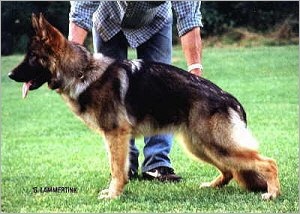 a male that dominantly produces sable, we would get only sable pups in different sable variations. On average, theoretically, 50% of them would be homozygous for sable and 50% would be heterozygous (AB). Since it is our aim to improve the black & yellow color, we could now theoretically combine this sable offspring (heterozygous) with a black & yellow partner. This supposed detour is very troublesome but gives us the advantage of having a wider choice of sable animals available for breeding. Nowadays, this second way is certainly only a theoretical one, since there is no existing male (at least that I know of) that dominantly produces sable. 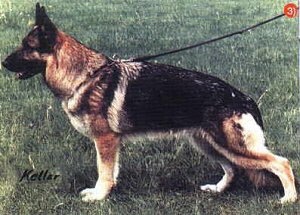 The attempt to try to breed a dominantly sable producing dog (homozygous for sable) would be of highest interest to me. If as a result, this dog would not be frequented because the prejudices against the sable color still prevail, this would be a rather frustrating situation, for me too. The interested breeder will probably ask the question where the purely sable producing dog received his genetic material. In order to determine that, we don’t have to go back in time a long way if the parents are sable and split producers as far as color is concerned. Consequently, only the first possibility comes into question (Illustration NR. 1), whereby 25% of the offspring is homozygous for sable. My very own male "Flick von Arlett" –himself not being sable- has proven with the appearance of his four progeny groups, to transmit, almost dominantly, his pronounced pigmentation, especially on the head. This ability to bring about a clear improvement of pigmentation even with the most lucid female, can be attributed to his sable ancestry on the maternal side.